Official white embroidered pin flag from the 2008 U.S. Open Golf Championship played at Torrey Pines just outside San Diego, won by Tiger Woods in dramatic fashion on the Monday playoff. LESS THAN 10 LEFT. ONLY 9020 FLAGS WERE PRODUCED (SEE SHIPPING LABEL) AND THE VAST MAJORITY ARE ALREADY OWNED BY COLLECTORS AND FANS. We have sold hundreds of these flags and are down to a few dozen! 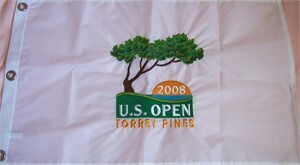 Please be aware that there are bootleg, counterfeit and fake U.S. Open flags offered on the internet. The flags we have were bought DIRECTLY FROM THE USGA IN SAN DIEGO AFTER THE TOURNAMENT!